Package includes:3 Soft brushes and 1 cute hair band. 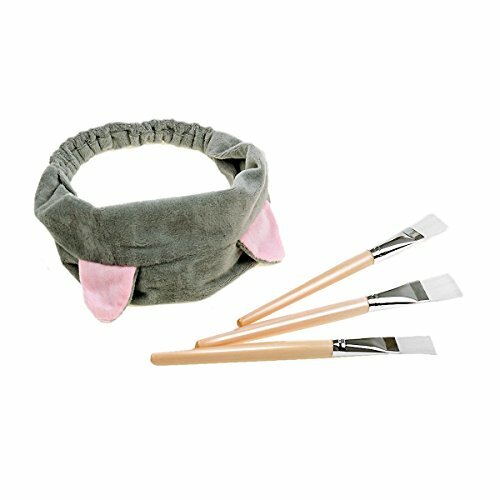 The brush is made of soft and comfortable nylon brush head with wooden brush handle. Portable size: the brush is 18.8m long ,easy to carry in bag.Convenient for traveling. Professional and home use: Lightweight and comfortble to hold,suitable for professional facial nursing and daily home using. Flexible hair band: Lovely cat ear design,the hair band is cute, soft, and stretchy enough for your head. Range of usage: suitable for all area of your face such as nose, eyebrows, lips, eyelashes, and cheeks. Such a cute set and really cheap!